How to draw a cylinder that has an irregular cross section and changing along the cylinder length? 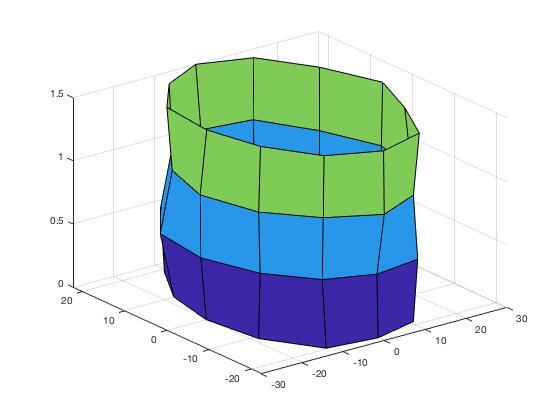 I need to draw a cylinder that has a different radius around the rotation axis, and these radii change along that cylinder, these data may be helpful to get the point. What's preventing you from creating multiple cylinders and then concatenating them together graphically? how can I concatenate them? You essentially have radius, as a function of theta, and z. And I don't have your data, since all you gave us is a picture. It is just as easy to attach a .mat file, or even a text file! A picture of numbers is NOT worth a thousand words. It is almost worthless. So I'll make up some data. The only thing of importance is I made sure the first and last radii are the same at 0 and 360 degrees. Note my use of sind and cosd, because you used degrees. Now just call surf. This will work as long as you have R2016b of MATLAb or later. Easy enough to fix using bsxfun or even repmat if you have an older release. Would not even be that difficult to put an end cap on the ends. Just a pair of polygonal patches. Easy enough to fix, although there are many good reasons to upgrade. REALLY old releases might use repmat instead of bsxfun. 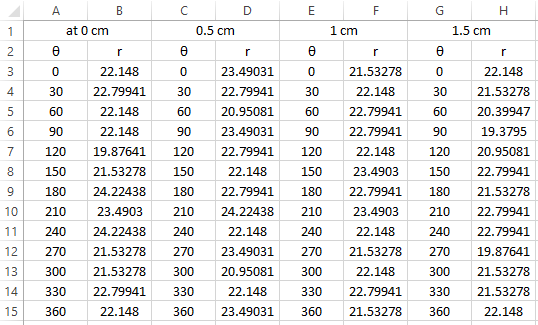 One more thing please, if I want to add my data from the table how can I add them rather than the random values? Your table is what, a spreadsheet? Use a tool like xlsread. Then reshape the array to be 13x4, or whatever shape is appropriate for your problem. yes it is a spreadsheet, ok thanks a lot. One more thing is it possible to make this cylinder closed? Well, I did mention how to do that, but only briefly. You have the data for the lower and upper values of z in the cylinder. So you can create a polygonal region in x and y, with a fixed z. Then just call patch or fill3 with the coordinates of those points, and whatever color you wish to fill it in with. So one call per end of the cylinder.